uane Elmer offers the tools needed to reduce apprehension, communicate effectively and establish genuine trust and acceptance between cultures while demonstrating how we can avoid being cultural imperialists and instead become authentic ambassadors for Christ. - Publisher With the new realities of global interconnectedness comes a greater awareness of cultural diversity from place to place. Besides differences in food and fashion, we face significant contrasts of cultural orientation and patterns of thinking. As we travel across cultures, what should we expect? How do we deal with culture shock? 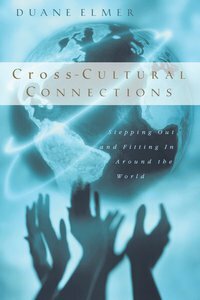 And can we truly connect with those we meet?Experienced cross-cultural specialist Duane Elmer provides a compass for navigating through different cultures. He shows us how to avoid pitfalls and cultural faux pas, as well as how to make the most of opportunities to build cross-cultural relationships. Filled with real-life illustrations and practical exercises, this guide offers the tools needed to reduce apprehension, communicate effectively, and establish genuine trust and acceptance.Above all, Elmer demonstrates how we can avoid being cultural imperialists and instead become authentic ambassadors for Christ. Whether you are embarking on a short-term mission trip or traveling for business or pleasure, this book is both an ideal preparation and a handy companion for your journey. With the new realities of global interconnectedness comes a greater awareness of cultural diversity from place to place. Besides differences in food and fashion, we face significant contrasts of cultural orientation and patterns of thinking. As we travel across cultures, what should we expect? How do we deal with culture shock? And can we truly connect with those we meet?Experienced cross-cultural specialist Duane Elmer provides a compass for navigating through different cultures. He shows us how to avoid pitfalls and cultural faux pas, as well as how to make the most of opportunities to build cross-cultural relationships. Filled with real-life illustrations and practical exercises, this guide offers the tools needed to reduce apprehension, communicate effectively, and establish genuine trust and acceptance.Above all, Elmer demonstrates how we can avoid being cultural imperialists and instead become authentic ambassadors for Christ. Whether you are embarking on a short-term mission trip or traveling for business or pleasure, this book is both an ideal preparation and a handy companion for your journey.